What is a biliary drainage? Biliary drainage is the insertion of a tube into the bile duct. This is most commonly carried out when the bile ducts are blocked. 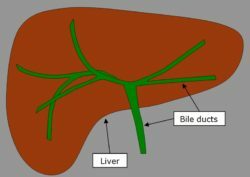 The bile ducts normally allow bile (a green-brown fluid that is produced by the liver to help with the digestion of fats) to drain from the liver to the small intestine (see Figure 1). When the bile ducts are blocked, bile cannot leave the body and builds up. This build-up produces a yellow colour in the skin called jaundice and can also cause itching and dark urine. Blockage of the bile ducts can occur for a number of reasons, including gallstones impacted in the ducts, narrowings in the bile ducts after previous surgery and involvement of cancer in the ducts. The drainage tube is placed through the skin into one of the bile ducts in the liver to allow bile out. Another common name for this procedure is a percutaneous transhepatic cholangiogram (PTC). How do I prepare for a biliary drainage? Do not eat or drink for 4 hours before the procedure. This is because the procedure is carried out under sedation or general anaesthetic – if your stomach is full, stomach contents can inadvertently pass into your lungs, which can be harmful. This can happen any time you have sedative medication or anaesthesia, not just with biliary drainage, and is the reason you are asked not to eat or drink. If you are diabetic, you are advised to check with the radiology practice before fasting. You may need to stop medications that thin your blood, as these will increase your risk of bleeding. Examples include warfarin (often sold as Coumadin or Jantoven), clopidogrel (often sold as Plavix), asasantin, heparin and enoxaparin sodium (often sold as Clexane). If you think that you may be taking any of these medications, please discuss this with the radiology practice before the procedure. Bring all of your usual medication(s) (or a complete list) with you. It is also recommended that you bring any recent X-rays or scans with you if you have copies at home. A relative or friend must be available to drive you home after the procedure, as you will not be allowed to drive after sedation or anaesthesia. It is also recommended that the relative or friend stay with you the night after the procedure in order to provide assistance. What happens during a biliary drainage? This procedure is usually carried out with the assistance of either sedation (medication to relax you) or a general anaesthetic. Intravenous antibiotics are also routinely given before the procedure. The skin of your abdomen is washed with antiseptic and then a very fine needle is inserted through the skin to administer local anaesthetic. This may sting for a few seconds before numbing the area. A small cut is made in the skin and a thin needle is passed through the skin into the liver and then into a bile duct inside the liver. Contrast medium (also known as contrast agent of ‘dye’) is injected into the bile duct, which allows it to be seen on X-ray pictures. X-ray pictures or images are taken to see the path of the bile ducts. [see Figure 2: Image from the start of a biliary drainage procedure. A tube has been inserted into a bile duct through the liver. X-ray dye has been injected to outline the bile ducts. A narrow portion of the bottom end of the bile duct can be seen (due to a cancer in this case)]. A thin wire is passed through the centre of the needle so that it lies in the bile duct. A thin drain tube is then inserted over the top of the wire and into the bile duct. One end of the drain tube will remain in the bile duct and the other end sits outside the skin where it is attached to a bag into which the bile drains. It is therefore normal for this bag to fill up with green-brown bile. Are there any after effects of a biliary drainage? After the procedure, you may need to recover from the effects of any sedation or anaesthetic medications that were used. There is usually some initial discomfort or pain where the tube passes through the skin. This is usually well managed with simple pain relieving medications. Sometimes the pain is severe and can go on for some days requiring strong analgesia. The drainage bag will need to be emptied regularly. You will be advised on how to do this. If the tube needs to stay in for a long time, some skin redness/irritation can occur around the point at which the drain enters the skin. How long does a biliary drainage take? Before the procedure, there are some preparatory steps that may take an hour or so to complete; these include recording your heart rate, temperature and blood pressure, inserting a cannula (a long thin plastic tube) into a vein and giving intravenous antibiotics. Inserting the drain usually takes 60–90 minutes. After the procedure, you will need to be monitored for at least 4–6 hours, and many patients are booked to stay in hospital overnight. If you are going home, you will require someone to drive you and stay with you overnight. It is advisable to discuss this with your doctor before the procedure. It is usual that you will have had some other imaging test(s) to plan how to do the biliary drainage and these might include computed tomography (CT) scanning, ultrasound and magnetic resonance imaging (MRI). They may be carried out on the day of the procedure or days before it. What are the risks of a biliary drainage? The risks of this procedure vary between different people. This is because some people will be significantly sicker than others before starting, and because some biliary drainage procedures are more difficult to carry out than others. In general, the risks include the risk of the sedation/anaesthetic and the risks of the procedure itself. Biliary drainage complications include bleeding (approximately 2 in 100 risk – the liver has numerous large blood vessels), infection (approximately 3 in 100 risk), leak of the bile into the abdominal cavity or into the space around the lung (1 in 200 risk). Complications may result in the need for emergency treatment or even surgery. The overall risk of death as a result of this treatment is approximately 1 to 2 in 100. However, if left untreated, a blockage of the bile duct is associated with a significantly higher risk of serious illness and death. What are the benefits of a biliary drainage? If you are suffering symptoms of a blocked bile duct, such as skin discolouration, itching, nausea and tiredness, a biliary drainage may relieve some of these symptoms over time (it often takes a number of days after the procedure for these benefits to become apparent). If the bile in the blocked bile ducts is infected, biliary drainage is an important part of the treatment. Biliary drainage often improves the liver function tests in patients requiring chemotherapy as part of cancer treatment. Who does the biliary drainage? Biliary drainage is carried out by a radiologist. This is a specialist doctor trained to carry out procedures using imaging guidance techniques, such as X-rays and ultrasound. The radiologist who carries out your drainage will send a written report to the doctor who refers you for the procedure. Where is a biliary drainage done? Biliary drainage is carried out in the radiology department of a hospital, in a dedicated room like an operating theatre where an X-ray machine is situated. When can I expect the results of my biliary drainage? The time that it takes your doctor to receive a written report on the test or procedure you have had will vary, depending on the urgency with which the procedure is needed. Burke DR et al. Quality improvement guidelines for percutaneous transhepatic cholangiography and biliary drainage. J Vasc Interv Radiol. 2003, 14: S243–S246.